Based on conversations with Gordon Wiseman. 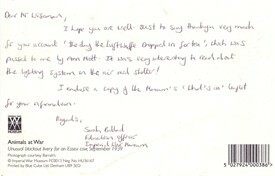 Thanks to Sue Horncastle for assistance with the transcripts. It was August 29th 1940, a day I shall never forget. I was seven years of age and at that time we lived in a council house in New Road, Great Wakering. At the very bottom of our garden was a home made air raid shelter. Click here for an enlargement of the photograph and a transcript of the postcard text. At about 4 o'clock that afternoon, my brother Norman and I stood on the roof of the shelter watching a dog-fight between some RAF Spitfires and German bombers, when, to our amazement, we suddenly realised that one of these bombers was heading straight for where we stood. It was only a few feet above the ground; we stood there unable to move like a pair of rabbits hypnotized in a car's headlights. The plane flew between two trees, taking both wing tips off before hitting the ground in a potato field no more than 100 yards from where we were standing. On hitting the ground the aircraft spun round 180 degrees and finished up facing the opposite direction. The first person to arrive was a fellow who lived just along the road; he was on leave from the RAF. The airman was quickly followed by some troops from the Highland Light Infantry who were encamped in bell tents in a meadow down the end of our road. The crew of the aircraft were quickly rounded up and taken away in a lorry. I distinctly remember one of the crew because he appeared to be so young, no more than 13 or 14 years of age. A follow up to this incident was that a squad of soldiers from the Essex Regiment were drafted in and posted at the end of the field where the plane had crashed to guard against souvenir hunters. They had a bell tent for sleeping accommodation and plenty of food but no facilities for cooking. My mother took on the task of preparing their meals. On another occasion, I was sitting in the pilot's seat playing with all the knobs and buttons when there was a sudden very loud hissing noise which frightened the life out of me. I leapt out of the plane, ran across the potato field, up the garden path and indoors like a scalded cat. I thought I had set a bomb off but thinking about it many years later, I came to the conclusion that I must have opened a valve to the oxygen tank. To me, at the age of seven, the years of the Second World War were very exciting times; I did not know what the consequences of war were. I had no fears and no two days were ever the same. Each day brought new excitements. This page was added by Robert Stephen on 15/03/2012.